Sales of new cars and light trucks in Canada have risen 4.6 per cent this year through July, representing an increase of more than 50,000 units over comparable 2015 volume, Desrosiers Automotive Consultants said. Editor's note: The percentage change in Ford's July sales was incorrect in an earlier version of this story. New light-vehicle sales in Canada declined 2.6 per cent to 173,304 vehicles in July, marking the second monthly decrease in 2016. But deliveries remain on track to at least equal 2015’s record of 1.9 million units, analysts say. 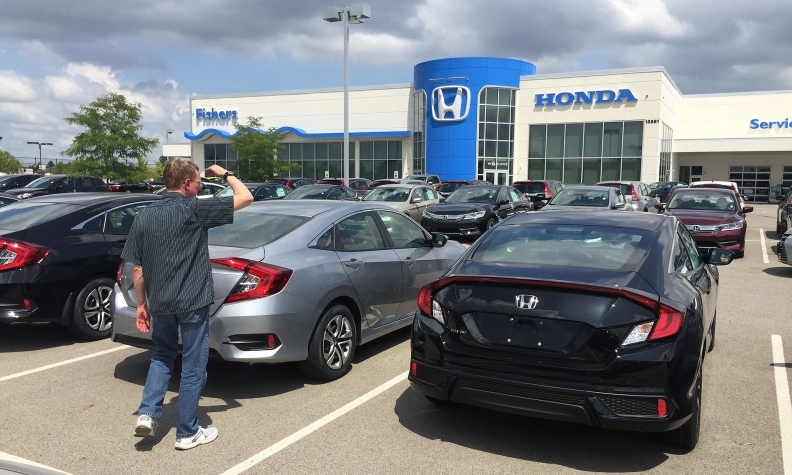 Sales of new cars and light trucks have now risen 4.6 per cent this year through July, representing an increase of more than 50,000 units over comparable 2015 volume, Desrosiers Automotive Consultants said. “Looking at the five months remaining in the calendar year, the market would have to underperform at an average of 10,000 units each month” for volume to fall short of 2015 levels, said Dennis Desrosiers, president of Desrosiers Automotive Consultants. Ford and Mercedes posted across-the-board gains in July sales while volume dropped 6.8 per cent at General Motors and 14 per cent at Fiat Chrysler. Ford said it moved 29,778 vehicles in July, after a record-breaking June, for a gain of 9.6 per cent. Mercedes-Benz marked its best July ever in Canada with 3,934 vehicle sales, an increase of 12 percent, or 405 additional units. At Smart, year-to-date sales are now up 46 per cent over last year, with 53 units sold in July. Fiat Chrysler reported sales of 24,669, down 14 per cent from a revised tally of 28,534 in July 2015. Year-to-date, the company has posted sales of 178,066, or 1 percent higher than a revised tally of 175,968 in the first seven months of 2015. The company originally overstated Jan.-July 2015 sales in Canada by 1,161 cars and light trucks. In 2015, FCA reported that it topped Ford by 15,323 car and light-truck deliveries to capture its first Canadian sales crown. The company has restated 2015 sales results in Canada through July using a new reporting method following a similar revision in its U.S. sales figures. The company, aiming to be more transparent, made the change in its sales reporting practices following an internal audit in 2015 and amid an investigation by U.S. authorities into claims it inflated sales figures. The company has not released revised sales for the last five months of 2015. FCA said its retail sales across Canada slumped 16 per cent to 20,886 last month while fleet shipments rose 2.2 per cent to 3,783. While new-vehicle sales growth is slowing in the U.S., it remains stronger year-over-year in Canada, where any volatility tends to belatedly follow that of the United States. Scotiabank said in a report released in June that it expects Canadian auto sales to rise to 1.96 million vehicles this year, up from a record 1.90 million in 2015. At Honda, July sales slid 4 per cent, but company officials expect the dip to be temporary with the late-July introduction of the redesigned Ridgeline pickup and Acura MDX crossover. Sales of the Civic “could not match the exceptional results of last year,” Honda said in a statement. Still, with 5,365 deliveries in July, vs. 6,367 units sold in July 2015, the Civic remains the best-selling small car in Canada. After its best month ever for hybrid sales in Canada in June, Toyota notched a new record for July, selling 1,705 Toyota and Lexus hybrid models, up 37 per cent compared to last year. It was also a record July for more affordably priced Toyota brand hybrids, with 1,553 units sold, up 47 per cent compared to 2015; 334 Toyota Prius hybrids were sold. Hybrid vehicles represented nearly 10 per cent of Toyota Canada Inc.’s total deliveries for the month. Toyota also set a record for light truck sales for the 19th consecutive month with 11,142 units sold in July. At Nissan Motor Co., July volume dropped 8.1 percent to 11,547, with volume off 8.9 per cent at the Nissan brand but up 3 per cent at Infiniti. Jaguar Land Rover Canada and Subaru Canada also reported watershed Julys with JLR selling 996 units for a 48 per cent year-over-year increase. Jaguar notched sales of 331 vehicles, a 218 per cent increase over July 2015, led by the new F-Pace compact luxury SUV, with 179 units sold. Subaru volume rose 4.1 per cent in July, with 4,210 units retailed; year-to-date sales are up 2.2 per cent to 28,125, representing the Japanese automaker’s highest year-to-date tally in Canada ever, and putting it on track to achieve its fifth consecutive annual sales record. Other brands that posted double-digit volume increases in July were Volvo, up 34 per cent; Audi, with a 15 per cent gain; Kia, up 15 per cent; and Mini, where deliveries rose 11 per cent.